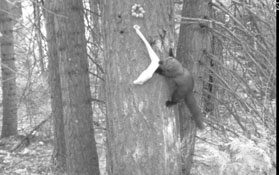 A Pacific fisher, captured by researchers with a motion-detecting camera, grabs at a bait-filled sock. A University of California wildlife research team working in the Sierra Nevada is asking the public to donate clean, gently used socks for research on a rare weasel called the Pacific fisher. The team is part of the Sierra Nevada Adaptive Management Project (SNAMP), which is examining the effects of forest thinning, as currently done by the U.S. Forest Service, on the health of local wildlife, the forest and water resources. The U.S. Forest Service implements these thinning treatments out of concern for excessive fire risk. But what kind of research could go through hundreds of socks a month? After years of experimentation, the research team has determined that socks are the ideal receptacle for hanging fisher bait in trees. The baited socks are hung in trees in view of motion-activated cameras. As the animal moves, climbing the tree and chewing on the sock, the camera takes photos that allow the scientists to identify the species. The researchers are going through 250 pairs a month, at a considerable cost, to create the “chicken in a sock” bait stations to survey the distribution of Pacific fishers in a 500-square-mile area of forest near Bass Lake. Besides the cost, Rick Sweitzer, UC Berkeley wildlife biologist and project leader. is spending time in the Wal-Mart checkout line with a cart full of socks when he could be doing research. The scientists don’t need new socks; they would prefer old, unmatched, non-holey ones,something everyone has cluttering up their sock drawers. to 40799 Elliott Dr., Oakhurst CA 93644.
promotes forest health, wildfire control and wildlife conservation. For more information, contact Anne Lombardo at amlombardo@ucdavis.edu. To read more about the research project visit the SNAMP website at http://snamp.cnr.berkeley.edu. sock can be downloaded from http://ucanr.org/blogs/Green.